Plans were unveiled in 2013 for redevelopment of the Dalston Cross Shopping Centre and 2104 may see a formal planning application. It's to be a 'residential led' scheme - no significant increase in retail space but new blocks with 500 odd flats above the shops ( up to 14 storeys high) and with underground parking beneath them. 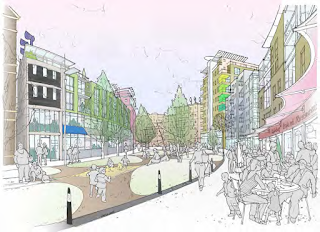 The route to the re-modelled Dalston Cross shopping centre from Dalston Square (and back) was to be a proposed linear Dalston Park, but late amendments to the Dalston Area Action Plan (after public consultation had closed) saw the Council's "vision" change . 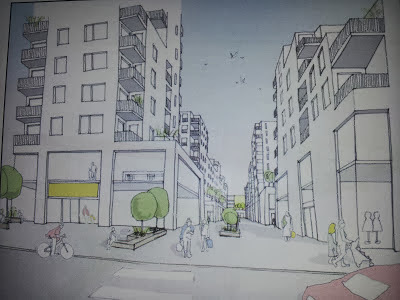 Now the route is not to be a park (where the award winning Eastern Curve Garden presently is) but a "shopping circuit" - an overshadowed pedestrian/cyclists thoroughfare lined with shops and nine-storey blocks of flats. 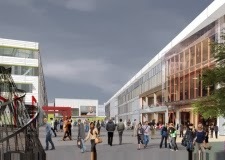 Hackney hopes the scheme will stop "spend leakage" - meaning locals won't need to go shopping at Westfield, Stratford City or the Angel - because we'll have the same shops here as everywhere else. (Just like Heathrow? Sigh. Ed.). How paying money into the off-shore bank accounts of national brand stores, rather than local independent businesses, will make Dalston more properous has yet to be explained....as is how it fits in with Hackney Mayor's announcement that "What we do not need is retail space and housing that, using the government's affordability criteria, is well out of the reach of most Hackney people "
Grey is the new green. Hackney's vision of the Eastern Curve Garden, transformed into a shopping circuit linking Dalston Square with Dalston Cross shopping centre. In 2013 Hackney's Planning Committee granted permission to the Transport for London/Taylor Wimpey partnership to build on two Kingsland High Street sites. The scheme fails to comply with the Dalston Area Action Plan (DAAP) criteria as to exemplar quality of design and height. After withdrawing an earlier application, a "revised design" was proposed for the northern site which, it was claimed "reduces its mass at sensitive locations to create a more responsive and sculpted form." TfL and Hackney ignored the local community's desire for some green public space on the sites by enclosing all available open space within the development. It is, in effect, a privatised enclosure of public land to create a gated community and will provide only 9, out of 106 flats, for affordable rent. The designs exceed the DAAP height guidelines and will dominate the High Street and its historic buildings. The overhadowing of a Grade II listed building, TfL's own consultants say, will be "Substantially Adverse" . The southern site will obscure views, and sunlight, from Ashwin Street's Reeves and Sons building which houses social enterprises like Arcola Theatre, Cafe Oto and the Bootstrap Company. With the continuing desperate shortage of homes, the London property market continues to provide high returns and a save haven for foreign investment. Government loans to home buyers indirectly subsidises the major housebuilders - Barratt, Taylor Wimpey, Persimmon etc - by keeping house prices and rents high, and guaranteeing returns for 'buy to let' landlords. Housebuilders snapped up cheap public development land with favourable public loans but continue to hoard their landbanks and drip-feed the market to ensure demand exceeds supply. 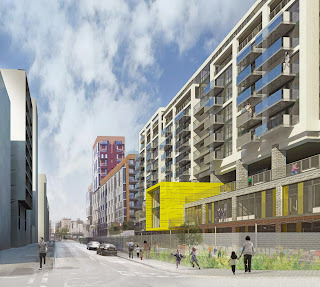 Barratt built the Dalston Square towers,and the TfL site behind the blue hoardings on Kingsland High Street is to be developed by Taylor Wimpey. In previous years foreign investors invested mainly in high value new build development, but now the trend has extended to all new build developments. Even local Hackney estate agents have a China desk. Fearing another house price bubble, the government recently switched subsidies from housebuilding to business loans and is finally to impose capital gains tax on foreign investors. The big housebuilders, like Barratt, have been pulling strings to support the "simplification" of planning rules - AKA the "presumption in favour of development". So it's Hello to the Big Business Society and Goodbye bio-diversity and local character and, if you can't pay the rent or the mortgage, then it's goodbye to you too. 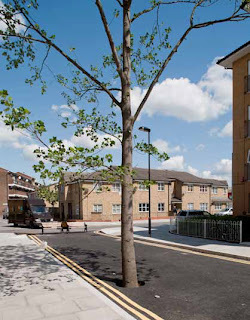 An image promoting TfL/Taylor Wimpey's proposals for "greening" Dalston, which is limited to planting some street trees. In one of the most populous wards, in one of the most populous boroughs in London, Dalston has virtually no public green space at all. 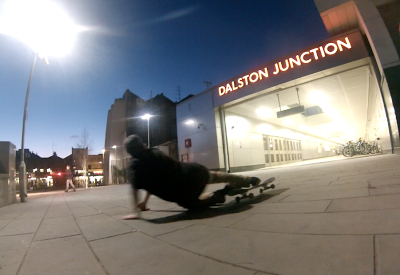 No apologies for plugging OPEN Dalston member Winstan's Whitter's newly updated documentary film Legacy in the dust . It tells the story of Dalston's legendary reggae club, its relationship with the Council and the police and how it went on to become the rave venue Labyrinth. In 2007 the authorities demolished the club's original home in the historic Dalston Theatre buildings at 14 Dalston Lane. They crushed it, ground it up and used it in the foundations for Barratt's New Dalston tower block development of 90% unaffordable flats. 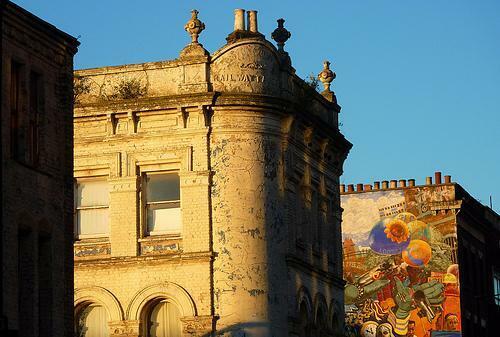 Thus we lost our historic buildings in Dalston and the thirty year cultural legacy of our African-Carribean community. 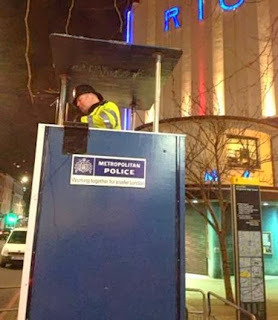 So now the authorities are calling the new tower blocks after the artists who performed in the club they demolished - Sledge Tower, Wonder House, Marley House etc. Patronising hypocrisy...or what? Did anyone ask Stevie Wonder if he wanted a Dalston tower block named after him? In 2013 we had a post-mortem on the cost of the 2102 Olympics - many London businesses had suffered, costs soared above all expectations and Hackney became unaffordable for many. Nevertheless Hackney claims to have secured a future legacy of 4,500 "new" jobs, by the sale of the publically-funded £295million Olympic Media Centre, to iCity. 40% of the site is to be leased to iCity to create a massive data-store, an activity requiring exceptionally few employees. Where will the thousands of new jobs come from to replace the previous thousands employed in the Lea Valley before the Olympic Games? Of equal importance will be the sale of development land for housing on the Olympic park which saw the excavation, stockpiling, and burial of 7,000 tonnes of radioactive waste on the site, without any prior regulatory inspection or planning permission at all. Curiously, the records of the extensive radioactive contamnination have become rather sparse - almost as if the radioactivity never existed - but consultants advised at the time that any new residents shouldn't eat anything grown in their gardens. What will the environmental legacy be for the future generations who will live on the 2012 site ? In previous years they burned down old buildings on Dalston's development sites or painted our surviving Georgian houses black - a somber reminder of the charred remains or a dark vision of more funeral pyres to come? In 2010, after four fires, three demolitions and OPEN Dalston's long campaign, Hackney bought the Dalston Lane houses back from the off-shore slum landlord to whom it had sold them at auction. It paid £3.8million - double what it had sold them for in 2002. Now, in the age of austerity when money is scarce, how would Hackney get its money back? The Council has agreed a 125 year lease to Murphy to convert the terrace into 42 flats and will take a lease-back of the ground floor shops. It will not be the "conservation led" scheme originally promised because, they say, these fragile old houses can not withstand such intense redevelopment. It is now proposed that all 16 Georgian houses should be demolished . 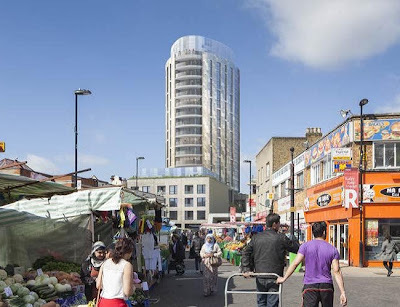 The proposed 19-storey tower, with £1million penthouses, next to Dalston Kingsland station. Only 14 of the 125 flats will be "affordable". 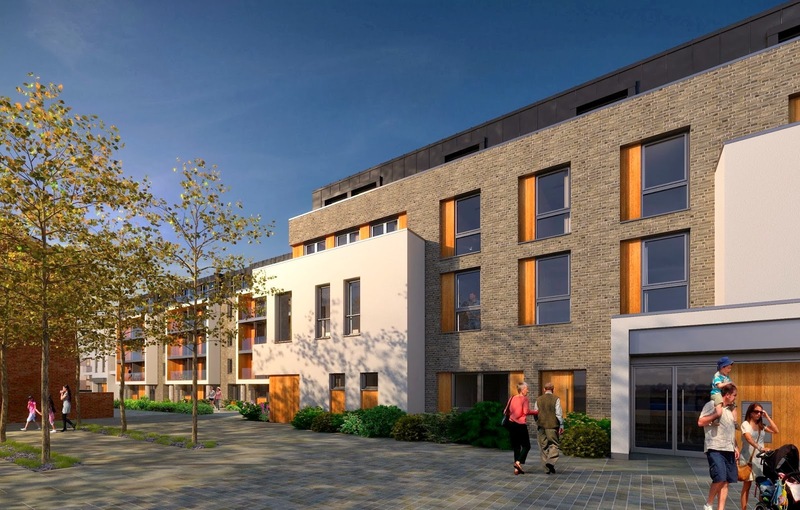 The developer expects to make at least £10million from the scheme. Last year , after a campaign led by OPEN Dalston, the Council's Planning Committee unanimously rejected a proposal by Rothas Ltd. for an 18-storey "dressed in green" private towerblock on the Peacocks site next to Dalston Kingsland station. We also said goodbye to Councillor Alan Laing who, like Hackney's former Deputy Mayor (Karen Alcock, currently Hackney Cabinet member for Property and Housing) was employed by the developer's PR company Four Communications. 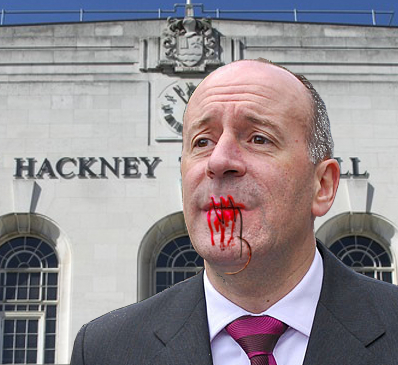 Would Hackney's Mayor Jules Pipe feel he had been stitched up and silenced at the Planning Committee meeting? Last year the Eastern Curve Garden, Dalston's only community managed public green space, had a visit from HRH Camilla, the Duchess of Cornwall, as part of her tour of Chelsea Flower Show fringe gardens. On 2013 the events list at the Eastern Curve Garden were never ending and you could even enjoy cakes and coffee in the new Pineapple House. But the Council says that Dalston's only public green space was always intended to be only for temporary use, until it is developed as a "shopping circuit" to support the future Dalston Cross shopping centre redevelopment. 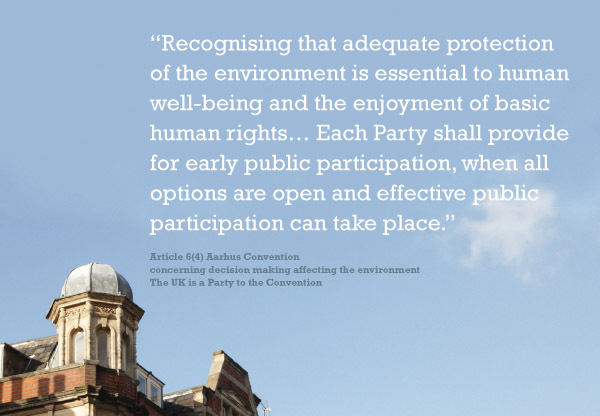 Public suppport for the Garden will be critical in 2014. Let's hope the Garden never ends! In 2013 a leaked report revelaled that the "intrinsic character, local distinctiveness and unique identity of Dalston " is at risk. 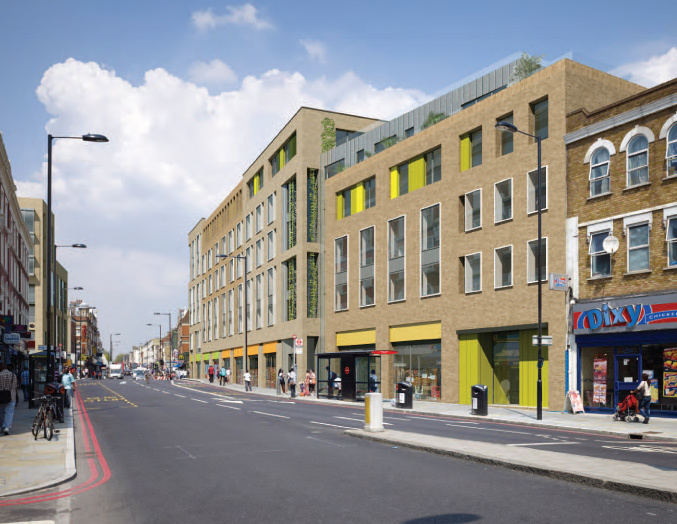 Dalston town centre is facing a tsunami of property development proposals. The report comments that Dalston's historic town centre environment has "wholly inadequate heritage protection at present " and recommends nine historic buildings should be listed and the creation of the Dalston Kingsland Conservation Area to protect the character of the area from excessive property development. Hackney will be considering the reports' recommendations in 2014 but in the meantime the Planning Committee has already approved schemes which damage the environment, and there are more in the pipeline. 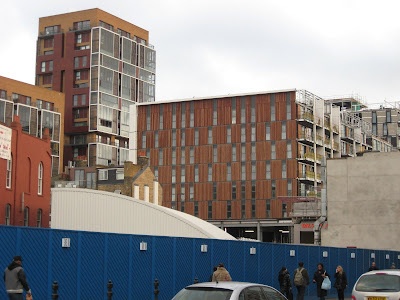 In 2013 residents of Dalston Square campaigned successfully to oppose redevelopment of Dalston's Holy Trinity Primary school, which was to be funded by cramming another ten storey block of private flats into Dalston Square on the school site. Residents complained about poor design and the loss of sunlight and privacy. Hackney's Planning Committee agreed with them, and turned the scheme down. The scheme, which would enable the school to double its intake, was suppported by the school and Hackney's Learning Trust. Boris' Greater London Authority decided to call in the application and overuled the local Planning Committee on the basis that the designs were adequate and extra school places were needed ( with a playgound on the second floor roof). The London Mayor's overarching powers, as regional plannning authority, were last expanded during Labour Ken Livingstone's tenure. Jules Pipe is the elected Mayor of Hackney, Chair of Hackney's 10 member Cabinet, and Leader of the local Labour Party. In 2013 the Cabinet decided to reduce transparency and accountability for its decisions by abolishing the all party Overview and Scrutiny Board and reducing full Council meetings from eight to five each year. Is there less need for scrutiny of decisions taken in the Mayor's name? Yes, if you read Hackney Today. No - if you read this or this or this or this or this or this or this. Bar entrepreneurs and clubbers object that the bourgeois arrivistes are killing the fun although, in fact, many of the local residents complaining have been part of Dalston long before it became the new Shoreditch and gentrified. You can read the debate here and here. Hackney has entered a development agreement with private contractor, Murphy, which now proposes the complete demolition, rather than restoration, of the Georgian houses at Nos 48-78 Dalston Lane. In 2005 English Heritage had declared the houses to be "remarkable survivors of Georgian architecture", and a "conservation led" project was to be the centerpiece of the newly designated Dalston Lane (West) Conservation Area. Now, due to years of neglect and vandalism, Hackney's plan is to demolish the houses and redevelop with front facades in "heritage likeness". 'Jon's Scooters' at Nos 62-64 suffered an arson attack and deliberate vandalism in 2004. Nothing was done to shore up, or rebuild, the houses which quickly deteriorated. There were two mysterious fires in other shops as well. The findings of the most recent structural survey, which Hackney accepts, state that "the façade of Nos 48-78 Dalston Lane had significantly deteriorated due to general neglect, weathering, fire damage and subsequent water damage " and is "generally in poor condition throughout, having suffered significant general deterioration". In 2009 many of the houses were painted black to obscure graffiti. The structural engineers have advised that "The areas of brickwork previously rendered or painted could not withstand the required cleaning process." 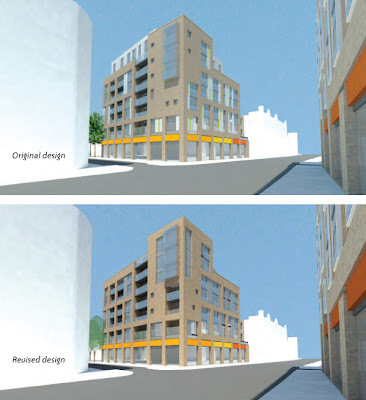 In October 2012 Hackney eventually granted itself planning permission for re-development.The permission is to convert the upper floors into 44 flats, including adding a mansard storey, and was to include renovation of the existing Dalston Lane facades and shop fronts. But the structural engineers have now advised that it is "impossible for the facade to support any additional loading that may be imposed by the proposed additional floor at mansard level" and that it would be "unsafe to attempt to retain the facades following any future demolition of the internal walls, floors or remaining roofs" because "there would be a high risk of collapse". However the Planning Committee voted for partial retention, not total demolition. This artists impression shows the latest plan to redevelop the terrace. Murphy will have a 125 year lease and market all the new flats privately, with no affordable housing. It will lease the ground floor shops back to Hackney. Of the existing shop fronts, they have also suffered severe deterioration, except for those of the two surviving businesses, 'Sound and Music' and 'Hy-Tec'. Of those, the surveyors comment, "the shop fronts to Nos 48 and 66 are to be retained however it will not be feasible to retain these in place without damage occurring during demolition and construction and they should be dismantled and stored off site". Mouldings are to be taken to enable reproduction of some of the decorative features of the shopfronts. The backs and interiors of the existing terrace houses are to be demolished and redeveloped as flats. Open space will be created by taking in some of the estate car parking, which Hackney will compulsorily purchase. The Dalston Lane Georgian houses have had a sad history. It was once a thriving street of independent businesses but tenants' leases were not renewed, shops were boarded up rather then relet, and no repair and maintenance was done. Despite the Dalston community's campaign, and Hackney's stated commitment to the historic environment, all are now to be demolished. We are now left to hope for a quality scheme and that new commercial tenants can be found for the ground floor shops. Artists impression of the proposed redeveloped terrace, with reproduction shopfronts, additional mansard roofs and glazed in-fills between the pairs of houses. 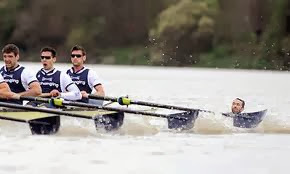 Trenton Oldfield, who swam into the path of the Oxbridge boat race in April 2012, will speak at the OPEN event this Thursday evening, alongside Iain Sinclair and William Taylor.